13th ed. -- of "A memoir of the Rev. Henry Martyn ...". Publisher: Printed for R. B. Seeley and W. Burnside, and sold by L. and G. Seeley. 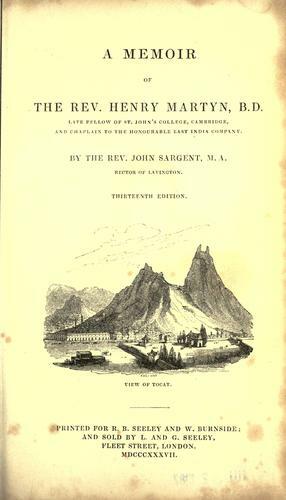 Martyn, Henry, 1781-1812., Publisher: Printed for R. B. Seeley and W. Burnside, and sold by L. and G. Seeley. We found some servers for you, where you can download the e-book "A memoir of the Rev. Henry Martyn …" by Sargent, John MOBI for free. The FB Reader team wishes you a fascinating reading!